The only attachment I have to any prior PS work is the bangin ramones track, so this being a mediocre/bad horror film means nothing to me. There does seem to be a lot that could be said about grief, parenthood(specifically fatherhood), etc but this doesn’t really do anything with it. This just kind of plods around with little to no atmosphere. Maybe I should get around to reading some King sometime. As a straight remake of the 1989 movie it's not awful, a few missteps (the weird digital nightshoots, wasting some side characters, the ridiculous ending) aside. Not as iconic, not as well set up, but certainly more tense. But in the age of Hereditary, I'm disappointed that they settled for turning this story of crushing parental grief into just another quick-cut spook movie. The original story has the potential. Now we have to wait another 30 years. This is a fairly solid adaptation until the last ten minutes or so. Changes that have been made seem reasonable. But the production itself feels a little silly. Even when the dread seeps in, there are moments to counteract it like despicably bad green screens and rushed information. Ultimately, the relationships between the characters run a bit hollow because they're not given the time to flourish. Good cat, though. Cat is aces. Better than the original, but not by that much. Stephen King'in ünlü romanından uyarlanan film, bütün korku filmlerinin klişe sahnelerini usulüne göre değiştirmiş. Senaryoda değişiklik göze batsa da, izlenmede sıkıntı yok. Hatta akıcı kurgusu ve iyi oyunculuklarda filmi izlettiriyor. Çok iyi bir korku olmasa da kötü değil. Din ve ölümsüzlük üzerine güzel göndermeler var. O kedi bu gece gelecek. 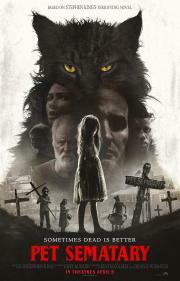 This movie is what would resurrect the next morning if you buried Stephen King's book in the Sematary. It's alright. The cast makes it work and it pulls off an eerie atmosphere, at times. It's not the best horror film you'll see all year, but Kölsch and Widmyer help the bloodcurdling scenes overpower the cheaper and more predictable screams, making this an operable springtime scare. All a bit silly. Not scary or creepy enough either. Every interesting aspect just gets forgotten about then it leads to a pretty underwhelming finish. Sometimes remakes are better. If someone were to put Fred Gwynne into an ancient indian burial ground so he could add some lacking spooky New England/Maine nonsense this would be much better. Lithgow only says ONE spooky Maine thing. Moves along way too fast but really, you can only bury something and have it come back so many times and be interesting. IM NOT SPEAKING OF ANY PRIOR EXPERIENCE. Pretty bland, generic horror thriller. It's very short and simplistic with not much plot. I mean, come on now...the book is almost 600 pages and they can barely squeeze a 90 minute movie from that?? I've never read the book and the TV ad spoils just about everything. Not sure where the apparently glowing critical reception for this one comes from. Lots of jump scares/loud noises, generic dark foggy spooky forests, creepy little kids, etc. Compared to the well-done It remake a couple years back there’s no emotional power to any of it. Other than more professional visuals it doesn’t improve on the old made for TV version in any way. Starts off pretty weak, with strikingly bland direction (disappointing from the guys who made the really cool "Starry Eyes") and some rather obvious and stilted dialogue. First act is honestly a slog to get through. Luckily it does get considerably better when things escalate, with the actors getting more to do and with some solid tension to liven things up. It still doesn't really take off and it never rises above being serviceable, so I don't know. It's fine. A swing and a miss. Doesn't even try to grapple with the source material. Quite good. Not the serious horror about grief it could have been, but still a good, mean, tale with its own sick kind of meaning. I'm for this story, but has anybody ever heard of embalming? Jason Clarke's acting duties rise from the grave and he has to stone face his way through the new twists and turns of this servicable adaptation. Watch for the adorable little Jason Clarke kisses while he comforts his wife. I kept wanting him to angrily call the cat "Toonces." A decent and entertaining enough horror flick that frightens like a ghoulie ghost ride, with the jump-scares and loud noises and spooky cemeteries. A sudden gory moment early on and the brilliantly horrific ending are the highlights, but everything else is quite dire -- these talented actors deserve way better, as they're given completely stock material that simply serves to push the story forward.